So small yet so large, all alone yet all together, seemingly intelligent yet mostly ignorant. Who — and what — are we? It is not simply that we go from dust to dust in terms of our lifecycle — and by we, I mean us individually and collectively — but also that we can conceptualize our essential dustiness from the electron to the universe, the infinitesimal to the infinite. Spaceship Voyager blasted off in 1977 on an exciting mission to photograph the planets and carry a cultural capsule called the Golden Record, a representation of humanity. Having done that part of its beautiful job by 1990, spaceship Voyager was being readied for its next and unknowable mission toward the edge of our solar system and into interstellar space (which it reached in 2012). It is now over 21 billion kilometers (13 billion miles) away from home. In early 1990, NASA was about to turn off Voyager’s camera to save energy, but Carl Sagan — Jewish, atheist, scientist, socialist, vegetarian — was able to convince a very reluctant NASA to turn Voyager around for one last photo of Earth, knowing that even if it would not necessarily have scientific value, the photo would be immeasurably valuable nonetheless. On Valentine’s Day 1990 — as a planetary selfie and a kind of cosmic love note to humanity — Voyager photographed what came to be known as the “pale blue dot”, as Sagan called our home, remarking that it was “a mote of dust suspended in a sunbeam”. Each one of us came into existence, just as life itself came into existence long before us, and the Earth came into existence long before that, and the universe long before that. Nothing contains everything and occasionally births something. Everyone who has ever lived — all humans, all other animals, all plants, all microbes, etc., whether known or unknown Earthlings — and everything they ever did and everything that ever happened to them, and is happening, is only on that one earthly speck of dust. Imagine an actual speck of dust. Rarely does one actually ever see a single speck of dust, because they are so small and there are so many of them. It does not really make much sense to speak of a lone speck of dust, just as it does not to speak of a lone human or a lone planet. We all come into being and exist in large, interconnected, overlapping communities with multitudinous relationships, each influencing all others in our own personal, social, cultural, emotional, spiritual, physical, atomic, and other ways. Each speck of dust, though, is made of something — hair, fur, skin, pollen, natural and synthetic fiber, minerals, metals, plastic, pesticides, particulate matter, even meteorite — and that something could sometimes be combined with something else, including bacteria, fungi, and viruses, perhaps being a tiny ecological world in itself. 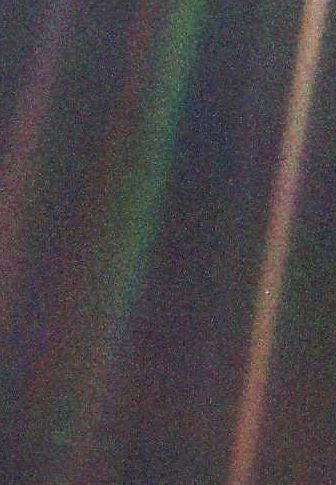 Just like the Earth — a less-tiny ecological world — appears as a speck of dust, as seen from Voyager. And just like our solar system seen from further out in space, and our Milky Way galaxy seen from even further amidst the trillions of expanding galaxies, and, if there are multiple and especially infinite universes, perhaps even our cosmos could be viewed as a single, super-small, and seemingly-insignificant speck of dust from somewhere far, far away. Each of us is a single member of our multi-billion member species, only one of several million of diverse albeit related evolving species, on a medium-sized planet orbiting an average-sized star in a marginal section of our medium-sized galaxy in a vast universe of innumerable galaxies, each containing innumerable solar systems with innumerable planets, moons, rocks, gases, specks of dust, energy fields, and whatever else. On levels not yet known — maybe not even fully knowable — we are all intimately and quantumly entangled, as we are all separate yet we are all one. As California conservationist John Muir famously stated, “when we try to pick out anything by itself, we find it hitched to everything else in the universe.” Or, as physics philosopher of Princeton University, Hans Halvorson, says speaking of what he calls superentanglement, everything is connected to everything. Some have called it interbeing. We are each in the universe as much as the universe is in each of us, as well as in each of our cells, and we are all in it together. The odds of this planet being hospitable when no other known planets are, the odds of abiogenesis happening, the beginnings of organic dynamic life from inorganic inanimate materials, and the odds of you being alive, especially in this time and place, when no one else can be quite like you, is astronomically higher than winning the lottery. As Deepak Chopra recommends, you should “celebrate the very improbability of your existence”. 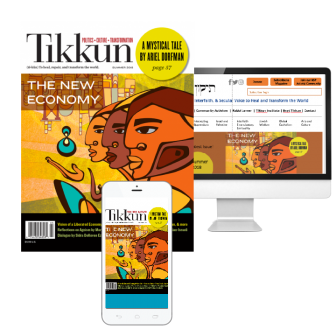 Humans are a relatively new species and a particularly dangerous one to both ourselves and others. Of the seemingly-solid part of ourselves, most is empty space, as is true of everything else, whether atoms, buildings, or the entire universe. The nothingness in between everything overwhelmingly dwarfs the somethingness of existence. Yet we have much to learn about the dark energy, dark matter, and whatever else pervades the so-called nothingness of the universe. Most of the Earth is covered in water, just as most of our bodies are made of water. Of our solid particles that aren’t water, most of us is not quite human. We are each a super-organism, a dynamic collective of multiple species with trillions of cells embodied in human form. We are mostly comprised of otherness: bacteria, viruses, fungi (including yeast and mold), protists, archaea, algae, and other microbes, with only a minority of what makes a human body actually being comprised of human cells, each of which is, again, mostly water and mostly empty space, with each of us exchanging particles, energy, elements, heat, air, water, information, emotions, microbes, and more. In terms of the quantity of cells, our microbiomes are the biggest part of our macrobiomes. Regardless, we are and always will be star stuff, as all the elements in our bodies derive from the stars, long before the Earth was born. Everything is made up of atoms, each of those being made up of various smaller subatomic particles and each being mostly empty space, and everything born eventually dies. This is as true for us individually as it is for our species, planet, sun, solar system, galaxy, and presumably universe. Yet, in a certain sense, we are not going anywhere. Albert Einstein — Jewish, agnostic, scientist, socialist, vegetarian — discovered that energy (E) and mass (m) can be converted into each other. He adeptly conveyed this fact to us in science’s most concise and poetic way, shorter than most recipes or haiku: E=mc2. Einstein showed through his theory of special relativity that mass and energy are interrelated, just as his theory of general relativity shows that space and time are interrelated. Our physical mass came from energy and it dissipates back into energy, from the microcosm of an individual to the macrocosm of the universe, each simply a speck of dust floating along and vibrating with all others in our complex, diverse, interrelated, beautiful, and expanding existence. If it’s a closed system, there is no away to go. Richard Feynman recognized that “science knowledge only adds to the excitement, the mystery, and the awe” of our world. Or, as Stephen Hawking put it, “Science is not only a disciple of reason, but also one of romance and passion.” These are some of the reasons I find science so radically amazing and so deeply spiritual, as well as fun and exciting, without the need for supernatural beings or beliefs. We already have everything we need — ourselves and each other. Dan Brook, Ph.D., teaches sociology at San Jose State University, writes ebooks, edited a non-profit social justice cookbook, and dreams by night and day.